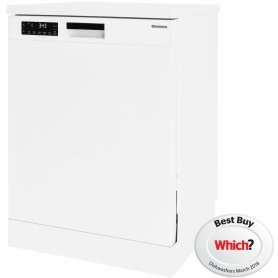 Washing your dirty dishes has never been easier, thanks to the Blomberg GSC9124 dishwasher. Adjustable settings and a choice of programmes give you sparkling clean dishes, every time. This full size dishwasher is compact enough to fit under your kitchen worktops but big enough for the family’s dishes. As a freestanding design, it can be placed anywhere you like – it doesn’t need to fit inside existing kitchen units. The sleek white design is eye catching yet understated, blending effortlessly in with the look of your kitchen. Choosing the right programme for your dishes couldn’t be easier. The short 30 minute programme is perfect when you run out of clean plates or cutlery, while the quick full load programme delivers an A class wash in only 58 minutes. Three other programmes are offered for maximum flexibility, all adaptable to full or half loads to save on water. The dishwasher has enough room for 12 place settings of cutlery, glasses, plates and more. The top and bottom baskets can be tweaked to help you fit things in. The top basket is height adjustable to accommodate taller items and has racks for holding delicate items like glasses and mugs securely. In the bottom basket, the racks can be folded down to fit in large or awkward cookware. 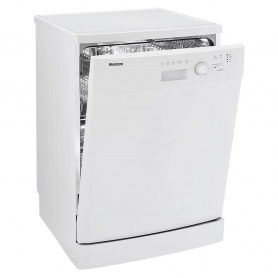 This Blomberg model has lots of extra features that make life easier. With A ratings for both washing and drying, the GSC9124 is designed to give you the best performance and results, while it’s A+ energy rating will keep your electricity bills low. It makes very little noise, and the hot air drying method means you can put the clean dishes straight into the cupboard. To give you peace of mind, an anti-overflow safety feature is included so you don’t have to worry about coming home to a flooded kitchen. There is also a counter balanced door, which opens smoothly for easy loading. The Blomberg GSC9124 has a great choice of programmes and added features to make doing the dishes a breeze, not a chore. Order yours today.